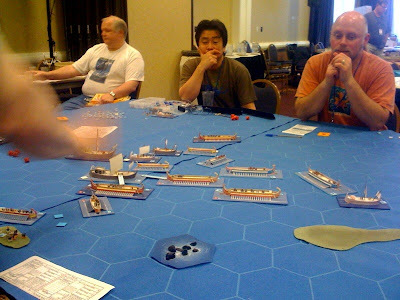 Today, May 24, 2009 is historic, in that I managed to survive GMing my first-ever WAB game - at a Convention, no less. Actually, I had a lot of help from Bruce D. - a very experienced WAB gamer. 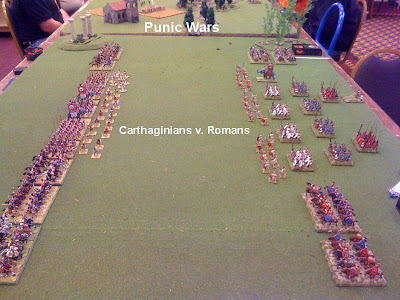 Also, Adrian & Dan were on the next table running their large Punic Wars game. Indeed, I called over to Adrian several times when Bruce "disappeared" a couple of times. 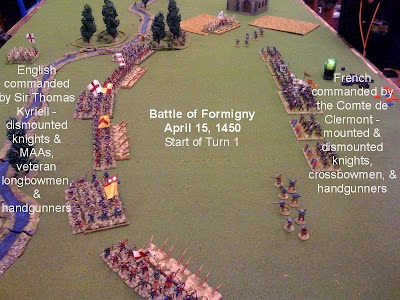 First off, I'd like to thank all of the aforementioned folks, and also Kevin Smyth for loaning me his English longbowmen. Not only for this game, but for the play-test games leading up to today. Also, thanks again to Adrian & Dan for the use of their game board & terrain - and of course, Adrian's English (some finished just days before). Now on to the game itself. 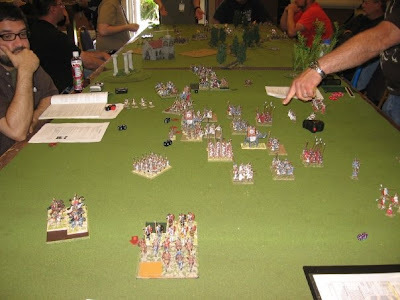 The 4 players for this game included Bryan Shein of Pacific Sky Games (& outgoing President of NHMGS), Damond Crump, author of "Patrol" - a great set of WW2 skirmish rules, and Kim Harris from Eastern Washington and board member of Tactical Solutions, a convention held in Spokane. So, with folks like these, you know I was under a lot of pressure; actually I couldn't have asked for better players. They not only had a lot of patience with me trying to get my GMing down, but also had everything to do with the game flowing so well. We actually finished 6 turns (the agreed upon finish) in well-under 3 hours. We were allotted 4 hours. The English players were very intuitive & aggressive. 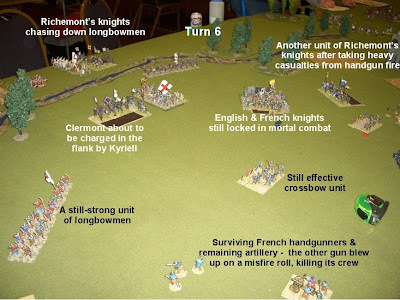 They utilized all of their forces well & the end of turn 6 saw much of the French forces with heavy casualties. 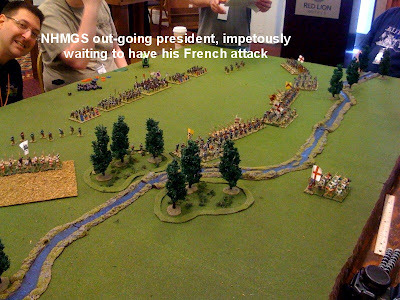 the French had good intentions, but consistently bad dice rolls. 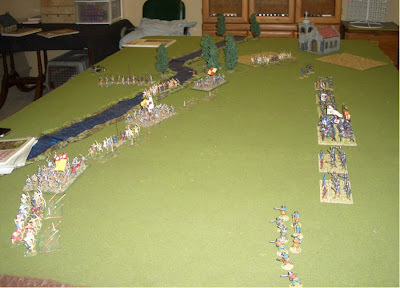 The battlefield itself was largely still contested, though - no side had a clear advantage over the other. It was somewhat of a draw. The interesting thing was that this was the closest finish in favor of the English for the four games this battle was gamed. 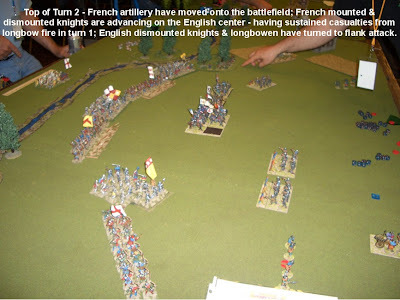 The three earlier play-test games all ended with the French looking like they would end up winning. 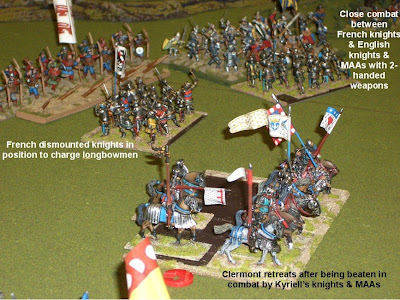 In large part to the arrival during turn 3 of Richemont's two forces of mounted knight - which was unknown to the players. 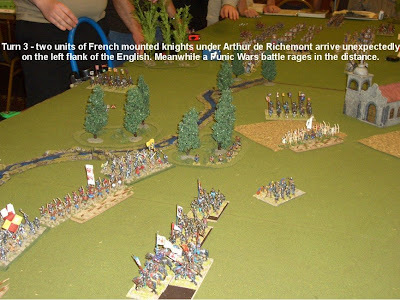 During the actual battle, the arrival of these forces did in fact turn the battle in favor of the French. Here are some photos I managed to take in between my not-so-perfect GMing. Which must not have been so bad, as all the players said they had a good time & forgave me for any mistakes. 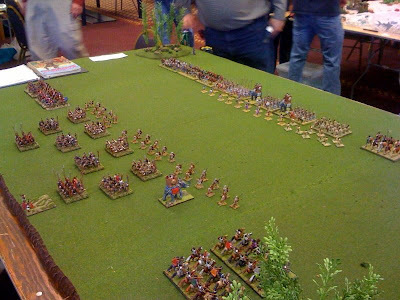 Here are some pictures of the Punic Wars game run by Adrian & Dan - I apologize for not captioning or describing the action going on. I was lucky enough to play a Roman Seas game hosted by Eric Hotz on Saturday - very enjoyable - definitely a game I would like to play again. 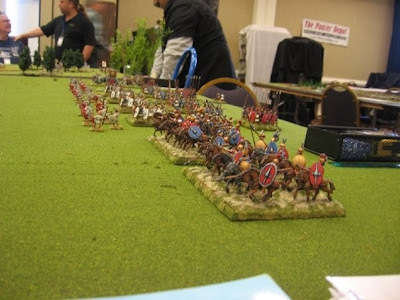 Here are 24 of 30 Old Glory WotR dismounted knights w/2-handed weapons. The other six still need their tabards done. I polished the armor using a combination of using a Dremel with a plastic bristle brush head & then the side of a needle - I think this is called burnishing. Select areas were given a black wash then buffed a bit with a Q-Tip. I'm sure painting the armor silver is faster, but I like this finish. The figures are given a final protective coat of Krylon Clear (gloss); appropriate parts have a flat finish using brush-on Vallejo matte. Here's a pic of the basic layout of the units for the start of the game. 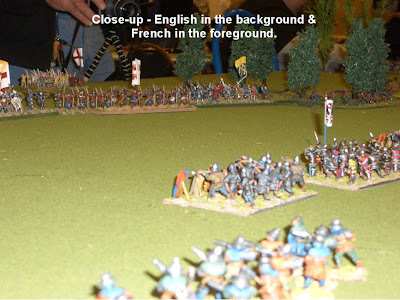 Actually, some of the English forces aren't exactly in place, as we had just finished the game & were in the process of re-staging them again - hopefully for one more play-test game; for me to hone my GMing skills more than anything else. The English have their backs to the stream.